In the 1920s Alfred Munnings’s second wife, Violet, who was a superb equestrienne, bought a cottage, ‘Riverside’, at Withypool in Somerset. She hunted on Exmoor with the Devon and Somerset Staghounds, enjoying more challenging terrain than the hunting in East Anglia. In 1940 Munnings’s home, Castle House at Dedham in Essex was requisitioned by the Army and he moved to Withypool, finding a curious freedom in the midst of conflict by painting pure landscape, unburdened by irksome commissions. Munnings wrote lyrically of Exmoor: ‘In the spring white blackthorn blossom, and later the hawthorn. With glistening stalks of dead bracken around, and young green fronds uncurling through … bluebells a faint mist on the slope, and songs of blackbird and thrush in the air, I have sat in the shadow of an aged thorn in blossom, painting massed white blossoming trees below, casting their shadows on the hillside and their scent all around. Farther below still, the gleam of a small stream rippling over stones in the sun, its sweet, silvery music ascending, mingling with the blackbird’s song’. 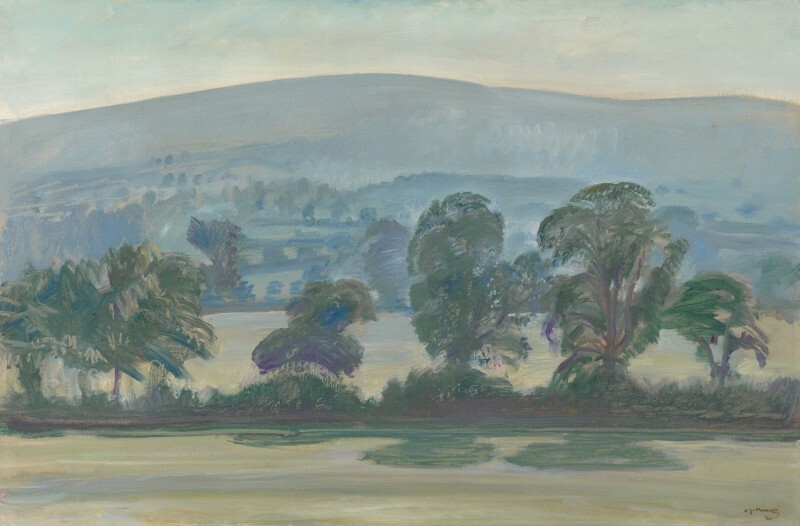 This work depicts a favourite motif which Munnings painted frequently before and during the Second World War, the view from Selworthy (on the northern side of Exmoor, about eight miles from Withypool) to Dunkery Beacon. The Beacon stands on Dunkery Hill, at 1700 feet the highest point on Exmoor. The open-ended composition gives a sense of the panoramic, unfettered landscape. So different from East Anglia, with its gentle hills, fields of wheat and flower-strewn water meadows, Munnings found a new source of inspiration that perhaps took him back to the wild countryside of his Cornish sojourn, before the First World War. He painted Dunkery in every time of day and type of weather, pitting his vision and technique against changeable Nature in the way that Monet caught every mood of his gardens at Giverny. A number of these Dunkery paintings can be seen at the Munnings Art Museum at Castle House. In Dunkery Beacon from Selworthy, the rich agricultural terrain of the foreground, with a line of elms and other trees casting coloured shadows, gives way to the hazy, bare moorland, which rises to meet a horizon that glows with a faint line of apricot beneath a cloud-flecked blue sky. The painting is a poetic assemblage of gentle tonalities, with cool blues and greens predominating. The vigour and immediacy of Munnings’s technique is apparent in the rapidly-brushed shapes of the foreground trees and the textures added with a dragged, half-dry brush and highlights scratched with the wooden end of the brush. Munnings’s deep and delicate response to the natural world is fully apparent. Sir Alfred Munnings, The Finish, London 1952, p. 105.